Last night, I dreamt that I was attending a homam in progress. The person doing the yagna was the Thiruchendur Murugan Temple Iyer  whom I always pray to as Lord Murugan  and my Uncle, Sri Mama. The fire was big and I was seated in front of it. Sri Mama was chanting the sapthakanni 108-potri and the Thiruchendur Iyre was offering ghee into the fire using a long brown wodden stick. This was all that I could recall from my dream. As I awoke to get ready for work, I assumed that Murugan wanted me to attend this puja as He would perhaps bless me (?) through the vibrations created from the homam. With that mindset, I went to work. I left around 4pm from work that day to go and pick up the rental car we were going to use to drive to the NY Ganesha Temple. After we picked up the rental car, I drove home and took a shower and dressed myself with a veshti to go to Sri Mama's house for the Chithrai Powrnami pooja. When I went, everyone was gathered and ready to begin. I performed the puja previously (last month) and this time another family was performing the yagna. I simply sat, while others sang bhajans. Then Sri Mama called me,"[my name], You do the abishekam for Amma [in tamil]." I was shocked as I did not expect anything by attending this pooja. In fact, I felt a little guilty as I would not have normally attended this puja were it not for that dream I had last night. 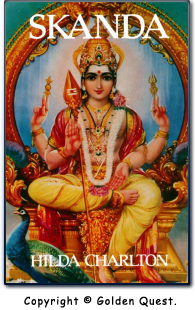 I performed the puja constantly thinking of only Lord Skanda's feet the entire time. Though I was doing the abishekam for the murthis of Lord Ganesha, Sri Raja Rajeswari, and other murthis, I could only allow my mind to think of Sri Skanda's wonderful feet - seeing His form in these murthis. The puja went well. I was very happy and left for home immediately after I partook of the prasadam. It was 12:30 am when we came back from Sri Mama's house. We (my mother and I) left for New York City (NYC) at 1:33 am. When we arrived at the border at around 3am, we encountered security. By Lord Muruga's grace, we did not have any problems with security, especially since the post september 11th terrorist paranoia. We slept at the duty-free shop parking lot for an hour, as we were very tired. At 4am, we resumed our course to NYC. It seemed like we didn't even sleep for that one hour! I let my mother sleep as I drove through Syracuse and Binghamton. Ironically, this area was supposed to be the most dangerous as there were many cops hiding to give tickets to those who exceeded the speed limit even by 5mph. In addition, this area is where people mug and carjack those who pulled into the rest area when they got tired of driving. However, this was all very transparent to us, again by Lord Murugan's Grace. We didn't even know about the tight monitoring by police and car jacking until we reached New York when someone told us about this. We arrived at Watchung, New Jersey (NJ) at 2pm on saturday. We decided to take a detour and visit my Uncle Panchalingam. He offered to let us stay at his place and leave for the temple the next day. At NJ, we visited the Venkateswara Temple. It was a magnificent piece of architecture and one I have never seen before in my life. Every carving and temple framework was beautifully crafted out of marble. I meditated for half-an hour and felt the temple's sanctity and vibrations as I was able to fully concentrate without the normal thought-wandering. We left and spent the night at my Uncle Panch's house in NJ. That night, I had a dream. I dreamt Sri Narayani Amma. She was seated in front of Sinnamma and was smiling at me. In her hand was theerthum. She took a spoon and offered some theerthum to me. I drank it and took pathanamaskar. I then awoke. My interpretation of this dream was that Lord Murugan blessed me through Sri Narayani Amma. He also showed that Narayani Amma accepted my prayers to her when I went to Sri Mama's house even though I was only thinking of Murugan the entire time! The next day, we left for the Ganesha Temple at 11am. We arrived at the temple located in Queens, New York City at 1:15pm. We brought fruits as offerings for Lord Skanda. This temple, too, was just as magnificent as the NJ temple. It was a little smaller though, but nonetheless, very beautiful. I offered my medical school application to the priest and did an archana for our entire family. The priest accepted our offerings and application and placed them at Sri Skanda's feet. The priest then blessed us and me to do well in studying medicine. I was then approached by a lady who saw the Skanda book I carried with me to the temple. She said,"Excuse me. Is that Skanda's book?" She said,"I love that book. I hug it and read it every night when I go to bed. After I finish reading, I put it under my pillow. He has helped me and my family so much." The lady devotee? was very happy to see me and inquired as to why I would travel all the way from Toronto to NY to see Murugan. I explained to her the divine signs I received for the puja and how it relates with my application to medical school. She was happy to hear my story and blessed me and told my mother how lucky she was to have me as her son. At 3pm, the temple began to be filled with a lot of people from various ethnicities. These people were Hilda Charlton's disciples, who like us, were attending the once-in-a-year Chithra Powrnami Poosai for Lord Murugan. I was amazed at their devotion when the priest conducted the Skanda Puja. Nowhere have I seen so many people (non-Tamilians) gathered with immense love and devotion for Lord Murugan. In all the temples I have visited I have never seen this many people (american, african, chinese, south american, north indian, south indian, european) under one roof worship Murugan with such an undescribable and unquantifiable love! I was so happy and felt a sense of brotherhood and belonging amongst these people. We were connected together spiritually by our love for Skanda and Hilda. When we chanted Lord Skanda's sacred mantra 32 times, during the peak of the puja, I could feel the intensity and powerful vibrations that arose as a result of the harmonious chanting by all the people. It was a wonderful feeling that I have never felt before and one I fail to describe fully in words. Throughout the pooja, I asked in my heart, "Skanda can you please show me some sign that you have blessed me? I have travelled a long distance out of love for you. Please, bless me?" After the puja, the priest requested all who gathered to form a line to pray to the aarathi, receive theerthum and vibhuthi. I managed to squeeze in line. The temple was very quiet inspite of the number of people gathered. As the line proceeded, the priest distributed vibhuthi and theerthum to the people. When I came by, the priest for some reason smiled at me and said,"Don't worry. Lord Skanda blesses you!" He then raised both his hands in blessings. I wanted to do pathanamaskar but he said,"No need. Your prayers were enough." I was dumbfounded upon hearing this. Why did the priest choose to say those words to me? And why me? - there were many people gathered here. I actually stood to waited to see if the priest spoke to any of the other people, but he never said anything again. Lord Skanda had delivered to me his message through the priest! He heard my heart's call for His blessings and He readily responded! After the puja, there was a memorial for Hilda in the auditorium of the temple, however, we could not stay as we had to drive back to Toronto. So we said our "good-bye" to Lord Skanda by singing His favorite hymn  Kanthar Anubhuthi. 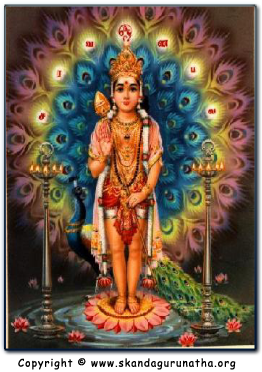 The form of Skanda present in the temple mulasthaanam was Aarumuga-Swami (Skanda with six-faces). After we sang Kanthar Anubhuthi, we prostrated before our beloved Lord and thanked Him for giving us the grace of His darshan. We then left to drive back to Toronto, because I had to work the following day. I have always viewed rain as a blessing from God. As we left for Toronto, there was a huge thunderstorm. It rained so hard that I could not see beyond the car in front of me. My mother cursed the rain because it slowed our travel, but I quietly smiled thinking to myself,"Sri Skanda is showering his blessings upon us today! Thank you Muruga!" All I wanted from this trip was for Murugan to bless us overcome our lower selves so we can attain His lotus feet. And my answer came, three days after our trip with the following dream. Last night I had a very short but pleasant dream. I dreamt that I was in a forest-like area. I remember seeing a small pond filled with dark bluish water. I recall the sun's rays on the horizon and ascertained that the time of day was either dawn or dusk, but I was uncertain which of the two it was. But there was sufficient light to see the trees surrounding the pond area. Suddenly, there appeared six big red lotus flowers in the pond. And then there appeared six rays of light, which appeared from the sky and made contact with the six red lotus flowers. The golden energies of light then assumed a form and before me stood six little boys standing on the six red lotus flowers. Each boy looked identical to the one next and the each had a Vel which rested on their right hand, which was raised in the abayahara pose  dispelling fear and bestowing blessings. It was Lord Skanda! He was wearing a golden crown, His chest adorned with jewels, and His form wearing a veshti. As soon as I recognized it to be Him, the lotus flowers floated towards the center and merged into one. And there stood only one boy! He was in the middle of the pond and was a little distant from the land where I was standing. I then awoke! I immediately recognized the form that Sri Skanda took in this vision. He looked exactly like the picture you see on your right. However, the myol (peacock), snake, and vilakku (lamp), were not there in my dream. The rest of the picture, the Vel, the lotus flower, the dark bluish water, were present exactly as you see in this picture in the vision. Further, this vision confirmed in my heart that Sri Skanda was present in the Ganesha temple as Aarumuga-Swami. In the temple the Aarumuga-Swami had six faces, and in my dream, Murugan took the form of six very young and beautiful boys! Thank you my Dear Skanda! You have answered the question I was pondering when I came back from the NY trip,"Could you please bless me?" Because of this wonderful dream, the trip was all worth the expense, time, and travel. He responded to my prayers so quickly. Not even two days after our return, Lord Skanda bestows His divine grace! Thank you so much. I am so fortunate to be receiving your blessings and darshan. Being the person who has never had true trust-worthy friends, called by others as an "unlucky" person, and who was treated as a stranger by even his own family, I am ever-grateful and dedicated towards you my Lord. You are my world, you are my friend, you are my mother and father, you are my guru, you are my God! Thank you a million times for the divine experiences you have given me! Dearest Skanda, whom I love more than my own mother. May you guide, love, bless, and protect me with your grace and may your beautiful form be ever present in my mind's eye.